From Hasbro Toy Group. The definitive lightsaber of the Bladebuilders system provides kids with the unique components needed to create 100+ combinations from their imagination. 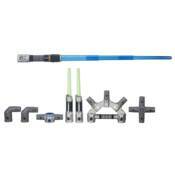 The Jedi Master Lightsaber comes with a main Lightsaber featuring lights and sounds, two independently-lit lightdaggers, expansion hilt, two elbow connectors, dual connector, and cross connector. Combine with other Lightsabers in the BladeBuilders system (each sold separately) and imagine the thrill of battle with a custom Lightsaber! Requires three AAA batteries, included.